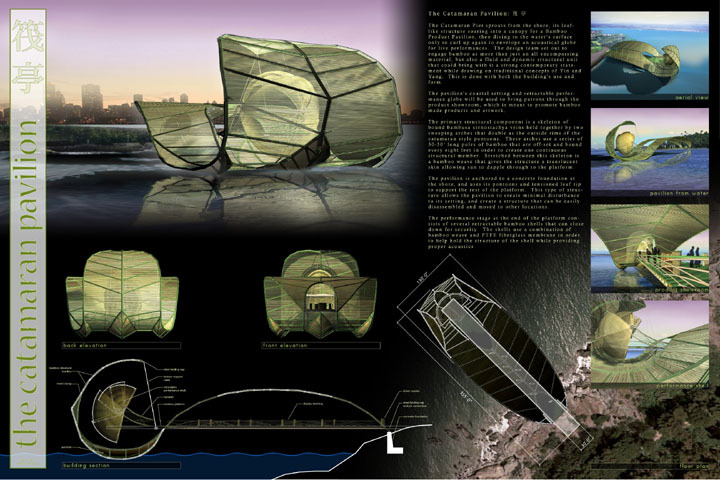 The Catamaran Pier sprouts from the shore, its leaf-like structure soaring into a canopy for a Bamboo Product Pavilion, then diving to the waters surface only to curl up again to envelop an acoustic globe for live performances. The pavilion is anchored to a concrete foundation on the shore. A combination of bamboo weaves and PTFE fiberglass membrane serve as coverings, while providing proper acoustics.